Mike: Day 17: We took the train from Shanghai to the old water town of Suzhou. The train was only a couple of hours and when we arrived we decided to try to walk with all our stuff to the hostel. We took the wrong turn almost immediately though and ended up wandering round for half a hour until we gave up and got a taxi. Good job too, we were a long way out. We check into our hostel. The place seemed nice if a little more run down than we are used to. The floors of the bedrooms are cracked concrete for example. The biggest shock came when we sat on the beds. I actually thought "is this mattress made out of wood or something?". Turns out, yes it was. You could see through a split in the side of the mattress cover that it was a thin bit of foam on top of a big chuck of chipboard. We left the hostel to walk round the town. Suzhou wasn't as we expected, it was a place we had picked out of the book only a day or so before and had imagined it to be a sleepy town with waterways/ canals running through it. Instead it was another city that had paved most of the waterways. We did find one street called "Pingjiang Lu" that was a small street filled with tea houses and shops selling traditional clothes, instruments and street food. All set next to a turquoise canal with ancient stone bridges from different dynasties and the occasional paddle boat going up and down. We stopped at one of the tea houses on the waterway to sample some traditional Chinese cha. We both just pointed at words on the menu not knowing what we were ordering and what we got was random flower infused tea (just flowers and hot water - the flower was what gave the water taste and aroma), we also got a selection of dumplings. Turned out well. In the evening we watched some films in the hostels TV room with some cheap Tsingtao beer and went to sleep on our beds with wooden mattresses. Day 18: - In the morning we went to Twin Dragon pagodas. It took a little while to find and although there wasn't much to see there, it wasn't a big tourist attraction (not even in the Lonely Planet, we just saw it the day before) So it was just us and a few elderly locals in the courtyard doing Tai Chi, praying or just hanging out. It was nice to see and although you couldn't actually go into the pagodas, there was enough to fill the hour or so before we had to get a train to Hangzhou. Whilst we were queuing for the train we met a small Chinese guy called "Danny". He was about our age and started talking to us. His English was broken but he seemed nice enough. We exchanged the usual traveller pleasantries and got on the train. He was seated in the same carriage as us, only a few seats in front. As soon as he sat down he came up to us and gave us a gift of some fragrant flowers that we'd seen taxi drivers use as air fresheners. Very nice of him. We thanked him and took to our seats, I was keen to try out my new 'Beats' headphones, the sound was really good through then, then I saw Danny approach us again. This time he said "I have a gift for you" he gave me wireless headphones! I was taken back, I read in the LP guide that it's extremely rude to decline hospitality, but this was too much. When we said we can't accept it, he didn't understand and re-explained how they worked through Bluetooth. After repeating that I couldn't take them a few more times, with no joy, we gave up and accepted them. He said my headphones were too big and all he wanted in return was for me to believe that one day he could visit England (he was travelling China at the time). We talked for the rest of the trip. Turns out he was a professional comedian and a pretty good one it seemed from the pictures he showed. We watched some SNL clips and old Jim Carey videos on his laptop. He wanted to be a DJ as well though, and liked Dubstep so we swapped some music. He even offered for us to stay with him and his brother in Hangzhou but I explained we had a hostel already. I have never quite met anyone that generous to a complete stranger before. It felt very odd accepting all this. We found a nice restaurant to eat at in a big building that looked like it was part Victorian, part Chinese. The menu was translated into English and for the most part it looked edible to us, good times. Day 19: The only destination was a huge lake in the middle of Hangzhou. The "West Lake" was described in LP as "the very definition of classical beauty in China" and although I wouldn't necessarily go that far it was very nice. It took a good 4 hours or so walk all the way round the lake and see all the little gardens, statues, islands and causeways. Although there wasn't anything stand out to write about the park and boat filled lake was all very nice. After the walk we were hungry having only picked up a snack from a stand, we went back to the restaurant we went to the night before to fill up on food ready for our epic 35 train journey to Chengdu. Day 20: The day was spent on the train, so there wasn't much to write home about. We bought food in Hangzhou before we left; we swapped some beer for sun flower seeds, dried peas and jerky with the women in our cabin. (Alicia: She was well weird. She'd turned up for a 35 hour train journey in a little black tutu skirt, black coat and knee high stiletto heeled black boots! And when she opened up her wheelie suitcase, she only had loose makeup, brushes and lipstick in there with no clothes or anything! Very strange. Maybe we'd met our first Chinese 'Lady of the Night' :S) Alicia and I competed over iPhone game "Fruit Ninja", write our blog and listen to music. That night the woman in our cabin left and was replaced with a friendly Chinese guy who could speak pretty good English. Turns out he's lived in the US for the last 16 years and is an actual, bonified Kungfu master! He even owns a Wushu school in Texas of call places (Wushu is what Bruce Lee did). Cool. Day 21: We arrived in Chengdu at 9:30am and with a little help from our friendly Kungfu champ we take the metro which arrives right outside our excellent hostel called "Lazy Bones". The staff are all incredibly friendly with great English. We checked into our 4 bed dorm (it was only £5 each a night) with no waiting around, dumped our stuff and headed out to explore. Near our hostel was a cheap canteen-esqe restaurant so we stopped there first. It handily had pictures behind the counter meaning we could just point at what we wanted. I didn't really enjoy what I had, some sort of spicy, boney meat, but Alicia's beef and rice was great. We'd be back many times in our time in Chengdu. Fed, it was time to sightsee. There could be only 1 sight that we had to visit in Chengdu, nope, not the pandas. It was of course the worlds biggest Chairman Mao statue (we are seeing ALL the wonders of the world ah?). Complete with armed guards there was a huge Mao statue in the centre of town, surrounded by flowers over looking a square. After Mao we walked round the bizarre People's Park. It's part tranquil park with ponds, bonsai trees, strangely shaped rocks and winding paths. The other part is a mental gathering spot for locals. There was loud music coming from every direction with all ages performing choreographed line dancing, a strip of red carpet that people used to practice their catwalk modelling skills, many terrible karaoke singers, people scribbling Chinese symbols on the floor and people gambling over cards or mahjong. We also bumped into an English chap we met from our Beijing hostel and walk round with him for a bit. In the evening the hostel put on a free dumpling party, where we learnt how to make dumplings with pork and cabbage filling. We all made a decent amount of dumplings, which we later got to eat. Alicia even won 3rd prize for the most creative dumpling which won her a Tsingtao beer from the bar. We stayed and drank in the bar until the early hours with a British couple, an American girl and later an older South African lady. Day 22: We got up early (6:45am) hangovers well and truly intact. The aim for the day was to head over to The Chengdu Panda Research Base, what Chengdu is famous for. 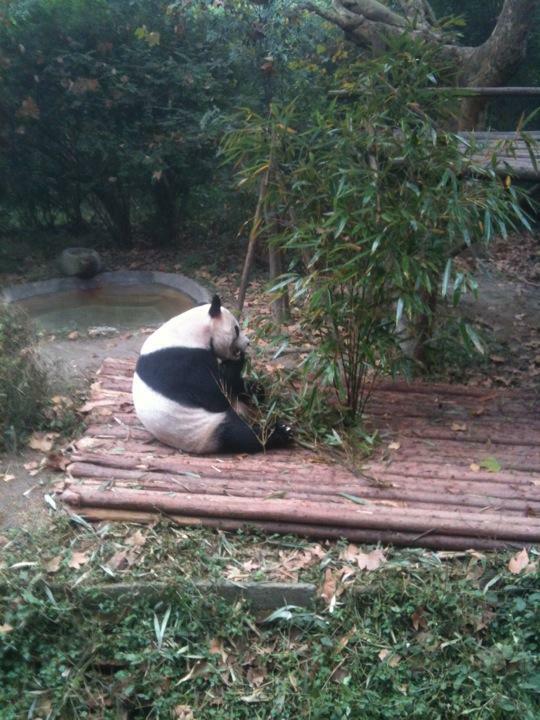 The early start was partly to avoid the Saturday crowds and partly because Pandas are much more active in the morning. To get there we need a few buses. The first bus we needed to catch was to a bus station, this was no trouble. We then had to get to a connecting bus to the Panda reserve. This bus was a little harder to find and it turned out was a small wooden bus located just outside the station. I gesture to the bus driver how much a ticket cost, she said ¥4. So I put ¥8 in their money box for both Alicia and me, all the while seeing another passenger staring at me, grinning. Only when I had finished putting my last Yuan in did I turn to her, she immediately laughed and exclaimed it was only ¥4 overall, then turned to say something laughingly in Chinese to the fellow passengers. How nice of her. Half way through the bus journey the bus stops unexpectedly (possibly because of traffic on it's route) and we are herded out the bus into another bus. This bus stops on a corner of a dual carriageway and we're told to leave. We have to then walk down the hard shoulder till we finally get to the Panda Research Base about 9:30am. It was ¥56 to get in and was pretty dead inside. We walked straight along to one of the adult panda enclosures where we are the first tourists and get a couple of minutes observing a big adult before a couple of Chinese tourists started to turn up. This panda was incredible, it was the size of a 'normal' bear (I imagined them to be smaller) and could hold bamboo remarkably well using an adapted wrist bone instead of a thumb. We then went to the juvenile panda enclosure which had a lot more tourists by this point. There were about 6-8 young pandas all playing and eating. They were much more active than the lone adult we saw so we stayed there and watched them for 30minutes or so. After, we visited the nursery where they had 2 very small panda cubs that were only just developing their black colouring and couldn't stand yet. They were laid in a cot within a mock up of a young child's room. The room was a bit strange, the pandas though were quality. We then leisurely walked round the other Panda enclosures. They were really well looked after; all had big enclosures with plenty of activities and air conditioned living quarters. It was definitely there to help preserve the giant panda population (only 1000 left in the wild and 2000 in the world) rather than it being a zoo. The highlight for me was the smaller Red Pandas. More closely related to Racoons than bears, they were much more active, playing, running up and down trees and we managed to get some great photos. The red pandas though seemed to be mostly overlooked by Chinese tourist compared to main attraction of the giant pandas. Lucky for them because despite all the signs telling people to be quiet, the Chinese tourists would shout, wave, whistle, make kissy sounds (similar to you would make to a cat) and bang repeatedly on the glass of sleeping pandas in their living quarters. All to get their attraction. It really amazed both of us that this seemed to be the norm, it wasn't just one or two people. I was glad the pandas paid no attention, one sleeping bear in response to a women slapping the glass repeated, moved itself into a corner, curled up with it's back to her and put it's paw over it's face and eyes. Smart. Shame it didn't stop her though. We visited the cinema and museum before leaving around 12:30pm. The buses didn't offer change (just a box to put your money into) and I only had ¥10 that almost no one was willing to change. Luckily the front desk did eventually change it for me and pointed us in the direction of the return bus. After a wait we jumped on the bus, it stopped in the middle of the road a few hundred metres down the road and the bus driver said something in mandarin. No idea what she said but it was aimed at us as all the other passengers turned round to look at us. Fortunately a girl sat next to me spoke some English and managed to explain that the bus driver said we were going the wrong way. My first thought was "are you kidding me?? You watch us get on and pay knowing we are going the wrong way, and now you expect us to get off in the middle of a dual carriageway?". We got off at the next stop and crossed the road for a stop heading the other way. Whilst tired and hungover, it wasn't what we wanted. After a half hour wait we boarded the bus we were told to get back. It's final destination was actually in the outskirts of the city though, at a bus station that wasn't the one we needed or even had on our map. By random luck we saw a bus going passed that our map said would take us close to home. After an exhausting journey back to the hostel we took a well deserved long nap. After we woke up we could better appreciated the pandas we saw earlier. About 5pm we headed to a fancy tourist area called "Wide and Narrow Lane". It was packed with people, cafes, restaurants and people offering traditional Chinese ear cleaning. We stopped at a noodle bar that offered freshly made noodles in broth. Day 23: We got up at 7:30am, didn't hang around and headed via the metro to the train station. We ended up queuing for ages firstly for an ATM, then for tickets as someone in front of us was booking around 100 tickets for a group, no exaggeration. There was also a small woman trying to push in the side which I was refusing to let out of elbow range. When we did finally get to the desk we had all that we wanted written down from the hostel (we checked availability with them before we left, there were tickets so we asked them to write in Chinese.) Firstly we wanted to buy our onward journey to Guilin, then our day trip for our mountain hike at Qingcheng (the reason we had got up early). The woman understood the paper but said there wasn't any tickets to Guilin for that day, the next day and the day after. We couldn't explain to her that we'd just had it checked at the hostel. So confused and worried that we'd be stuck in Chengdu for the foreseeable future, we asked about the Qingcheng tickets. She said there wasn't any of them as well. Despite a train running every half an hour through the day. We couldn't believe it. We had no choice but to leave. On the way out we checked the automatic machines for locals and they said there were a load of tickets left! We again tried to explain this to someone but they just directed us back to the queue for the same desk we'd just come from. A waste of time. We were both really gutted, but Alicia really took it particularly hard. We were stuck in Chengdu with no end in sight and the only thing we wanted to do, we couldn't get there. We got the metro back to the hostel and explained what had happened, they couldn't believe it either and pointed us in the direction of a nearby third party ticket seller. We walked down, and with them, no issue. We got a Guilin train for 2 days time as planned, and bought a return Qingcheng ticket for an hour and a half time. It cost us ¥5 extra per ticket. Bargain. Very relieved, we headed back to the hostel to relax for a bit. Before we headed back to the metro we stopped at a street vendor opposite the hostel and picked up some cheap and tasty dumplings (¥1 each). The metro and train went without a hitch, lucky as we didn't seem to be having a lot of luck with public transport lately. We got a tourist bus in Qingcheng for ¥3 between us and took the 5 minute ride to the base of the mountain. We arrived there at 1:30pm. The base of the mountain was really pleasant -there were big temples, small pagodas and random statues, including one of Kungfu Panda. The information we read there said that Mt. Qingcheng is literally the home of Taoism. The very first Taoist were in this mountain. Pretty cool. After paying the ¥90 entrance fee we headed up the most direct route, it took us through a load of monasteries and temple, natural looking pagoda made out of branches and moss, although surprisingly little worshiping went on. The highlight was a temple made out of a cave in a cliff face. As it was the most direct route, the steps were up steep and eroded making it a hard climb. We arrived at the summit (1600 metres up) at 4pm to great views with the surrounding mountains visible but covered in mist, making it look mysterious and uniquely different to other views we'd seen before. There was a huge gold pagoda with a massive taoist statue. It was a little cold so we took our photos, had an apple and headed down at 4:00. On the way down we were against the clock a bit before the park closed, it didn't stop us getting lost though. The way we took down was longer, but the stairs were a lot better. It was also quieter (no sounds of spitting or loud Chinese tourists). We stopped at a gorge and shouted as loud as we could into it. We also stumbled across at a lake that we hadn't seen on the way up as well as more temples, pagodas and a Tai Chi school. We arrived back at the mountains base as the park closed at 5:30pm. We were worried we might have missed the last bus, but after a 10 minute wait one arrived. We had to wait an hour for the train, but that was ok as looking at the available tickets now, there wasn't one till 8:47. We were both glad we booked the return trip earlier in the day. We boarded the train at 6:45 and took the 50 minute journey back to Chengdu. We went back to our favourite canteen for food, we ordered some cheap noodles, leaving room for dumplings from the dumpling lady across the road. But horror! She was closed. So we went back to the hostel and discussed what to do the next day. We had extended our stay in Chengdu to see "The Giant Budda" in Leshan, but as it was difficult to get to we needed to rent a van and we found people that wanted to go too. After confirming before we set out to Qingcheng, they then said they decided to go by public transport (saving them about ¥30each from the ¥160 each to rent a van and driver). Annoying. After some discussion between ourselves we decided it really wasn't worth it and declined to join them. Day 24: This was a lazy day effectively (Alicia: Seem to be happening a lot lately. I blame the cold weather) We got up late with no plans and just did nothing. For lunch we got some more dumplings from the women across the road. We researched Halong Bay cruises and booked a hostel in Hanoi. It was nice to have a bit of a relax after a busy few weeks. At 5:30pm we wandered out to see a monastery that was recommended to visit whilst in Chengdu. We got to the Wenshu monastery for 6pm when all the Buddist monks gathered for rituals and to chant/pray. It was cool to witness. We then walked around the gardens and the rest of the monastery until it was dark when we left and wandered around the local area looking at the shops and stalls. For dinner we headed to a nice looking restaurant (oddly located in a John Lewis style department store) to try our hand at a Sichuan Hotpot. You choose a soup, then a couple of ingredients to add to it. We then added dumplings (yeah that's right, we double dumplinged). The soup comes out first and is put on a hot plate in front of you (I had chicken, Alicia had pure fire - it was so spicy thats all I could taste anyway) then comes the raw ingredients, various herbs and vegetables, a lot of strips of meat - chicken, fish, lamb but mainly beef. You had to put each ingredient into the soup until it's cooked then dip it in some sauce that you create from their sauce bar. It was great, messy fun, it was a little expensive (¥156) but was definitely worth it. But we both left full and headed back to the hostel. About 10pm we saw the people return from Leshan (they left at 8am! So this took way longer than they expected) and luckily for us they said it wasn't worth the effort. We had a poor nights sleep due to two lads coming in noisily at 2:30am then snoring extremely loudly. We got up at 10am, packed, checked out and headed out to a nunnery to observe a Lunch Ceremony. It was listed as one of the top things to do in Chengdu, but it was just some nuns being served food in a room. It was nice to see that Chengdu had working places of worship though, most other temples we'd seen in China had been turned more into tourist attractions. After a quick look around we left to go to our normal canteen for a noodle lunch. Our train was at 2:55pm, so after a bit of a relax in the hostel we got the metro over and boarded the noticeably older train for a 26 hour journey to Guilin. Iain Haha, Ronseal! "headed out to a nunnery to observe a Lunch Ceremony. It was listed as one of the top things to do in Chengdu, but it was just some nuns being served food in a room"